Pearlescent Champagne rsvp card and matching A2 envelope. Stylish Portfolio Invitation in this season's popular Azure Blue and Champagne colors. DIY Wedding Invitation that is perfect for 2 languages. Easy assembly. Natural paper raffia calls beach grasses to mind -- making this invitation perfect for beach weddings Mails in handsome matching A7 envelope in 70 lb champagne Italian paper. Assembly: Fairly easy. DIY portfolio wedding invitation made from vibrant azure blue Italian pearlescent papers. EXTRA INVITE SHEET for two language invitation is 25 cents. 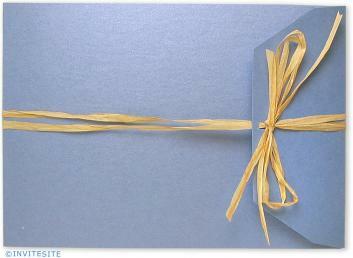 You would then put the rsvp set at the back of the invitation, held by the binding ribbon. PAPER FACTS: Paper and envelopes are made from FSC certified paper, made without metal or foils, is recyclable, biodegradable, elemental chlorine free. These papers are made in Italy. Finished invitation measures 5" x 7"
Colors: Azure blue and warm champagne papers and envelopes, ties with natural paper raffia. Kraft colored photocorners. Opens to a wide landscape of 16 inches. Colors: Azure blue, champagne beige and natural tan. Mailing Envelope:Matching champagne A7 pearlescent envelope. Ribbon:Two yards of natural paper raffia.